Not only tile flooring is appealing and functional for a variety of home improvement projects, but ceramic flooring and porcelain flooring are durable and stylish. At Ricci’s Home Improvement we carry all the major tile flooring brands to ensure you will receive high quality products at wholesale prices. Porcelain and ceramic tile floors reflect durability and taste, often looked upon as artistic additions to flooring projects as well as practical ones. 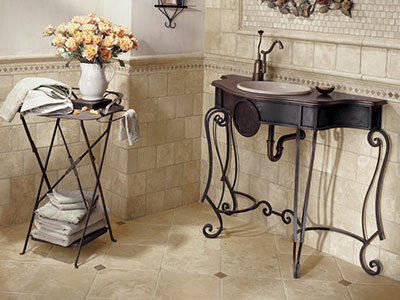 Ceramic tiles are derived from clay, baked in kilns at high temperatures, and are often either offered in glazed or un-glazed varieties to make for a unique flooring tile. Porcelain tile flooring is baked at even higher temperatures, producing an extremely hard, moisture-proof tile flooring surfaces. And in a class by itself, glass tile for floors reflect the imperial air of Roman and Greek mosaics, and offering a significant range of vibrant, decorative colors.